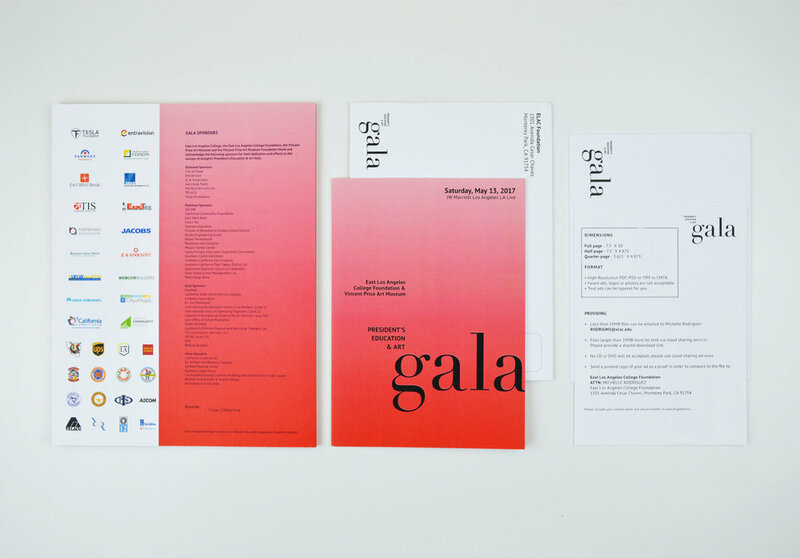 Design associated with the first East Los Angeles College & Vincent Price Art Museum's joint Gala. This project involved visually merging two distinct institutions with their respective styles: East Los Angeles College (traditional) & Vincent Price Art Museum (contemporary). Our typographic experimentations fused serif and san-serif typefaces to represent each of the institutions values and visual styles. A Spring palette inspired the selected colors and gradient approach - serving as both a literal and figurative representation of transformation. The design included the Save the Date promotional materials, printed invitations, donor cards, auction catalogue, event signage, presentation, and program book that features articles on honoraries: Ernest Camacho, Kevin De León, Deborah Marrow, and John Valadez. Trumbo’s book, “Johnny Got His Gun,” is a tale of an American Soldier from World War I who lost most of his body in an explosion but his mind kept intact, making him a prisoner of his own body. Our interpretation of the character’s turmoil and the dark recurring themes of memory and loss informed our creative direction. The stark contrast between the opposing forces of white and black values was used in the event collaterals to help elevate the story in both elegance and respect. The peace sign, taken from the book cover of the “Johnny Got His Gun” was broken apart in the front of the invitation conveying both the physical and mental rupture where the real effects of war collide. The invitation simultaneously presents the opportunity for the separate pieces to come together and form the peace sign, embodying the character’s newfound mission for promoting peace in the time of war. Thick card stock gate folded invitation card with card RSVP and corresponding envelopes. This public artist manifesto defines ethical work expectations for collaborators and freelance artists. 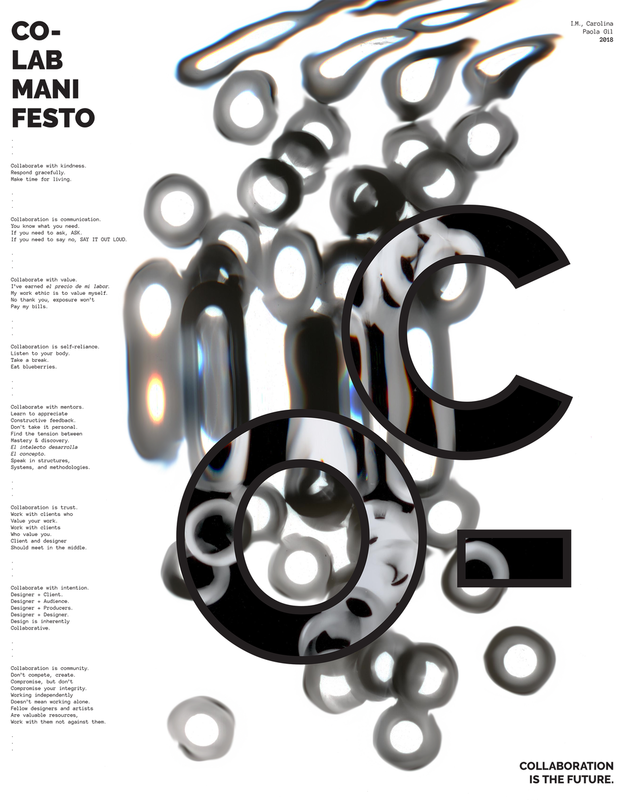 The manifesto is a declaration of standards with playful references to the nuances of a varied and personal work environment. The poster displays experimental imagery created in the darkroom using circular objects on light-sensitive paper; the subsequent image was later scanned and manipulated through both analog and digital processes. The merging of the single objects in the image reflects both the identity and methodology of collaborators as they redefine their roles as co-creators of original artwork. Collaboration with Paola Gil for Boss Lady exhibit as part of the Viva La Muxer annual fundraiser for the non-profit Las Fotos Project.